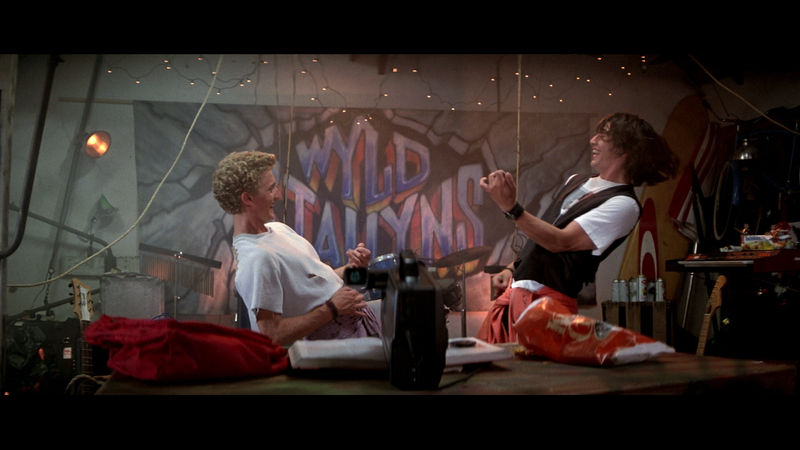 I first saw Bill and Ted’s Excellent Adventure (1989) when I was in college. In fact, I saw the film with a trio of friends, and if memory serves, my film professor at the time….who had to be dragged to the theater kicking and screaming. At the time, I thought then that the movie was a sort of sweet, dopey take on time travel that didn’t necessarily provoke deeper thought. 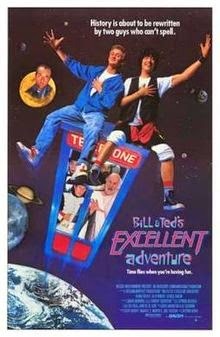 And Bill and Ted’s Excellent Adventure certainly fit in with its historical context: of teenage-based science fiction comedies made in the aftermath of Back to the Future (1985). My Science Project, Weird Science, and Real Genius all emerge from the same cultural ripple created by the Zemeckis film. And, in a way, Bill and Ted’s adventures also forecast the adventures of Wayne and Garth in Wayne’s World (1992) and Wayne’s World 2 (1993), at least to some extent. Critics at the time -- including my professor -- were not amused. On a re-watch this week, I found a few more points of interest in Bill and Ted’s Excellent Adventure. The film’s philosophical approach to time travel is intriguing, especially as it relates to the gimmick of the telephone switchboard, only with time circuits not phone circuits. Also, I enjoyed the film’s sense of fun about time travel, and the idea that anything you can think of can be instantly produced, assuming you remember, later in the day, to travel back in time and provide what you needed at that juncture in the past. This is precisely the way that Bill and Ted get out of their worst scrapes. Probably the most significant thing to recall about Bill and Ted’s Excellent Adventure is that it is a comedy film first, a science fiction film second. Accordingly, I can’t really quibble with the success of the scenes involving Napoleon eating an ice cream sundae, or enjoying a San Dimas water slide. Those moments are pure silliness, and yet still garner big laughs. Napoleon is the film’s break-out character, in part, perhaps, because he is granted the luxury of the most screen time. I prefer Bill and Ted’s Bogus Journey (1991) to this film by a wide margin, in part because it throws about a billion silly ideas at the wall to see what sticks and consequently never has a dull moment. But also because this inaugural effort doesn’t treat school (or school teachers) with much verisimilitude. In other words, I can buy that Bill and Ted go time traveling in a TARDIS-like phone booth. I can even buy that these two slightly dopey kids become the foundation of a future utopia. Party on dudes! But I simply don’t believe a teacher would allow them to pass their history classed based on the final project as it appears in the movie, or even that all the world’s great figures of history and philosophy would agree to participate in it. Genghis Khan wasn’t known for going along to get along. Yet, in a sense, that last joke reflects on the magical spell cast by Bill and Ted themselves. They are such amiable losers, I guess, that the future and the past bows before them without complaint. In San Dimas, CA, in 1988, Bill Preston, Esq. (Alex Winter) and Theodore Logan (Keanu Reeves), are in danger of flunking their final history project. If they do fail, Ted’s father plans to ship him off to military school in Alaska. Fortunately, a life-line arrives from seven hundred years in the future. 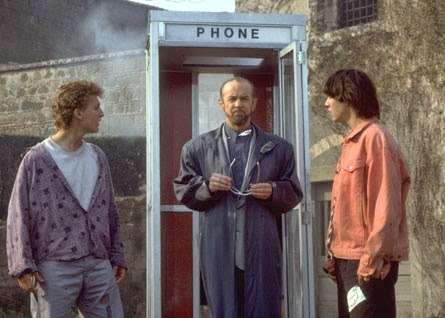 A man named Rufus (George Carlin) provides the boys a time traveling phone booth that will allow them to experience history first-hand, so they can prep the greatest school project ever. For Rufus, this is a vital matter. If Bill and Ted don’t pass this test -- and their history class too -- a future utopia in 2688 will fail to come into existence…and that is the very culture Rufus hails from. 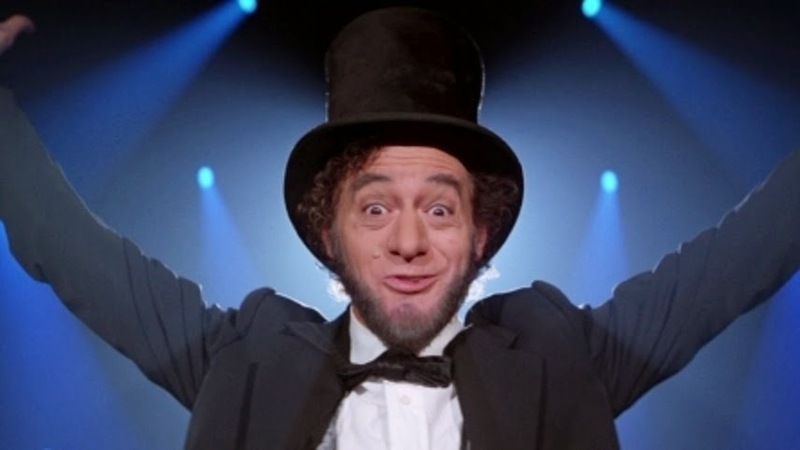 Bill and Ted head back in time to round-up historical figures including Napoleon (Terry Camilleri), Billy the Kid (Dan Shor), Genghis Kan (Al Leong), Joan of Arc (Jane Wiedlin) and Abraham Lincoln (Robert Barron). But will they get back to San Dimas in time to deliver their report, and can they manage to police an unruly crop of historical figures? The undeniable magic of Bill and Ted’s Excellent Adventure arrives in the central characters’ atypical mode of expression. In particular, the boys are (unknowing) masters of the malapropism, not to mention (as Vincent Canby did…), superlatives. In short, Bill and Ted’s Southern California mode of expression is horrific to grammarians but hysterical to audiences. Most of the laughs in the film arise from the conjunction of their very modern Surfer-type speech with characters we remember from history books and thus deserving of a modicum, at least, of respectful discourse. The film repeats the same joke over and over again (whereas the sequel parodies modern expression, Star Trek, views of the afterlife, Ingmar Bergman films, board games, and about a dozen other topics…). But for most of the first film's running time, this joke about expression and vocabulary is pretty damned funny, or at least chuckle-worthy. In terms of sci-fi concepts, the time travel angle of the film is intriguing, and unique. Most films concerning time travel don’t postulate that the present “continues” moving while time travelers are away in other epochs. But that’s the logical conclusion to be drawn from Bill and Ted’s Excellent Adventure. Even while they are in other eras, the clock keeps counting-down in San Dimas towards their history project dead line. In other words, because they are of that present, they move with it, even while they are in the past. The corridors of time themselves, are depicted visually as vast cords or cables in an old fashioned telephone switchboard. You can dial into any time period you want and make a connection to it, but the “present” keeps on trekking. In a sense, then, the present is a moving target. 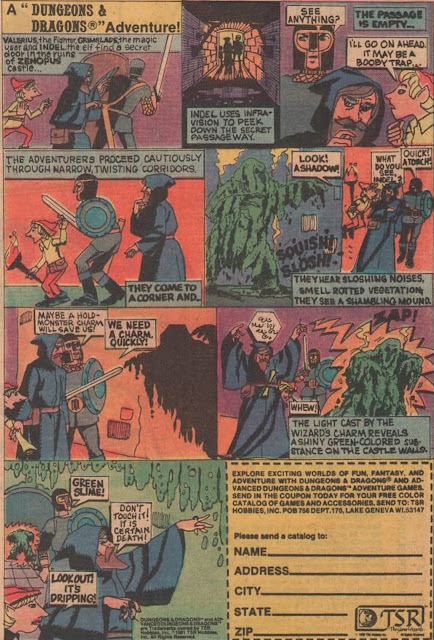 This idea is seen the prologue as well, as a Trio of future Elders/leaders check their watches and realize that a major test is coming up for Bill and Ted, the so-called "The Great Ones." Yet of course, that test occurred, chronologically-speaking, seven hundred years earlier. More significantly, I appreciate the film’s comic discourse on paradox. Early in Bill and Ted's Excellent Adventure, our heroes get bogged down in one. Their band, Wyld Stallyns, needs a “triumphant video” to succeed, but it also needs “Eddie Van Halen” on guitar. Yet he will not join the band unless they have a triumphant video. And they can’t have a triumphant video without his participation. This idea is reflected in the film’s last act, when Bill and Ted realize that they can -- while in the past – devise a plan to carry the day (like getting the police chief’s prison keys…) and have it happen instantaneously. They do so by traveling back in time, and planting those items when they are needed. Of course, this is a paradox too. If the boys don’t get out of their present predicament, they can’t return to the future to execute their plan of escape. But they have executed their plan of escape, because the items show up when and where desired, suggesting they were successful. This joke goes right back to the debate over which comes first, the chicken or the egg. Or in this case, Eddie Van Halen or the triumphant video. Where Bill and Ted’s Excellent Adventure proves markedly less than enthralling are in the terrains of production design and production values. The future looks cool enough, but the visits to the past are spliced with old movie stock footage (for the Napoleon segment), familiar back-lot Western towns, and other cheap expedients. The movie looks more like a cut-rate time-travel TV series of the 1960s – 1980s (Time Tunnel, or Voyagers! maybe) than it resembles a full-fledged motion picture. And because so many historical figures are brought into the present of 1988, they come off as one-note jokes instead of characters, with the exception of the aforementioned Napoleon. Joan of Arc gets into aerobics, Sigmund Freud fondles a corn dog (sometimes a corn dog is just a corn dog…) and Beethoven plays a modern synthesizer. None of this behavior is terribly surprising or original. In other words, the jokes are okay, if obvious, and don’t lead into any deeper or more humorous material. Similarly, George Carlin -- quite possibly one of the funniest human beings ever to inhabit the Earth -- is not given funny material in the movie. In the end, Bill and Ted’s Excellent Adventure seems a meditation on the concept that there are some of us who go through life working hard, barely making it. While others, like Bill and Ted, seem to glide through life with no real obstacles or anxiety, only to find all their non-effort rewarded by history, and society at large. They are dopes, it is true, but harmless, good-hearted dopes. The sequel is much better, in my opinion, because it puts them up against greater odds, and against more ferocious villains (including the Devil, and De Nomolos). They must earn their future in that film, rather than just sort or surf a wave to it, as they do -- metaphorically-speaking -- in this film. Comic Book of the Week: Who Framed Roger Rabbit? UFO: "Reflections in the Water"
UFO: "A Question of Priorities"